Put-in-Bay Golf Cart Rental | Reserve Your Cart Online For Best Prices! Be sure to reserve your Put-in-Bay golf cart rental in advance BOOK NOW! 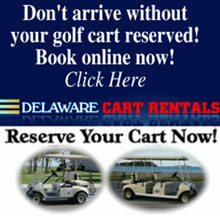 VisitPutinBay.org recommends Delaware Golf Cart for your golf cart rental needs! Wheels, where you want them —right in downtown Put-in-Bay across from the ferry dock. Delaware Carts is the islands largest Put-in-Bay Golf Cart Rental Agency with over 300 golf carts. Delaware Golf Carts is also Put-in-Bay’s only overnight golf cart rental offering the islands newest rental fleet. Put-in-Bay golf carts are the preferred method of transportation and are offered in 2.4.6.& 8 passenger configurations. Put-in-Bay Golf Carts offers only gas-powered carts which perform at the same speed all day long and do not slow down like electric golf carts. VisitPutinBay.org recommends using Delaware Golf Cart rentals for getting around the island, with a little over a thousand golf carts for rent, and some days over 5000 people, reserving in advance is strongly recommended! Their golf carts are among the newest golf cart rentals on the island and are respected brand names such as EZ-GO and Club Car. Put-in-Bay golf carts are offered in several seating configurations that will seat 2,4,6 & 8 people. Put-in-Bay golf carts are available to be rented by the hour, daily and Delaware Carts is the islands only overnight golf cart rental. Their golf carts are gasoline powered and unlike other rental agencies who operate electric carts designed for a few rounds of golf a day, these golf carts run the same speed for days with no recharging inconvenience. Fuel is included in the Golf Cart Rental rates so no need to refuel! Golf Carts are licensed motor vehicles and all traffic rules and laws apply to a golf cart the same as a car. This includes open container and driving under the influence. You must possess a driver’s license to operate a Put-in-Bay Golf Cart. Children or unlicensed drivers are NOT permitted to operate the vehicle and are subject to citation and or arrest if seen doing so. Overloading, or permitting more than the number of people your golf cart is rated for is prohibited. If you are observed with more than the number of people the golf cart is rated for, the driver may be cited and the golf cart confiscated. Any attempt to tamper with the speed control device on your Put-in-Bay Golf Cart will result in a minimum fine of $50.00. Golf Carts are set to operate at approximately 18 miles per hour for a safe driving experience. Strollers, luggage and coolers are permitted on the golf carts as long as they do not interfere with the safe operation and seating of all occupants. Open containers of Alcohol are not permitted on golf carts at any time anywhere. Put-in-Bay, Ohio maps are available when you pick up your Put-in-Bay Golf Cart Rental. Be sure to pay close attention to return times as closing hours vary by dates.